Splat Ball is a Minneapolis paint ball park located in Downtown. Come enjoy a fun-filled and action packed day of paintball with friends and family. Splat Ball is the perfect place to host your next big corporate event, birthday party, or even a bachelor party! The fun lasts all day when you are playing paintball. No need to worry about bringing your own equipment. We offer full rental packages that include everything you need to have a fun and safe day of paintballing. If you are interested in purchasing gear Splat Ball does have the best Pro Shop in the state staffed by friendly and knowledgeable paintball enthusiasts. 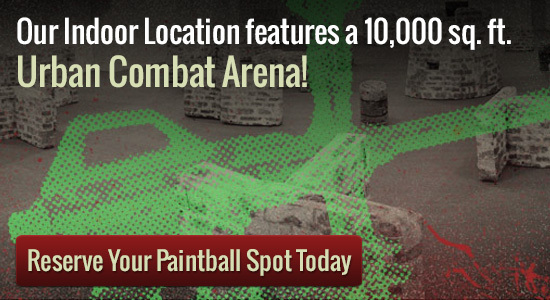 Splat Ball is the largest indoor paintball facility in the state with a 10,000 square foot urban combat arena. The entire facility is climate controlled so you can be comfortable no matter what the weather is like outside. There is even an observation area for those who just want to watch the action take place as well as a party room. Come join us for a day of fun-filled, action-packed adventure with your friends and family at Splat Ball! Our minimum group size for a private group is 8 people, but we can accommodate groups of over 100. We are capable of running private games 7 days a week, dawn until dusk. Please call us at 612-378-0385 if you have any questions or if you would like to reserve a time. Please call ahead in advance as reservations are required.